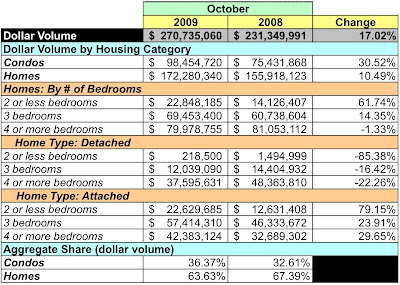 MRIS released its data for October signed sales contracts for existing home and condos in the District yesterday. As in the reports for the preceding few months, sales and dollar volume are up and prices are lower than the same period last year. More is selling, but for less. I must repeat: remember that we're now into the one year anniversary of the financial collapse kindly brought to us by the Bagatelle brunching idiots who work on Wall Street so YoY numbers right now (sales and dollar volume) reflect the effects of last year's near economic meltdown. YoY, aggregate dollar volume jumped 17.02%. 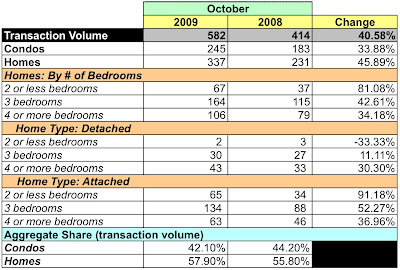 Condo dollar volume leapt 30.52% and that of homes grew 10.49%. Sales volume was strong, increasing 40.58% YoY. Condos and homes both shared in the positive growth, increasing 33.88% and 45.89%, respectively. Prices continue their tailspin. Average prices fell 16.76%. Condo prices fell 2.51%, while home prices dropped 24.26%. As in September [and August], not a single home category experienced higher prices YoY. 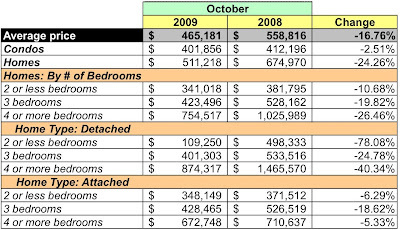 At October's sales rate, there is a 6.11 month's supply of condo units on the market, 14.23% more than September. For homes, 5.27 months, 17.53% less. By the way, if you ever want to hear what Bagatelle brunching idiots who work on Wall Street sound like, tune in to Sirius Radio on Saturdays from 3-6PM to listen to dance channel BPM's "Bagatelle Brunch" broadcast. If you listen real close between the sounds of David Guetta [turn off the sound before you click or you'll be rocking the house] and Paul van Dyk [someone is still using MySpace], you'll hear them laughing at us. What a huge increase in transaction volume!